To edit links, go to Edit -> Links. The LinksOverview page is loaded. 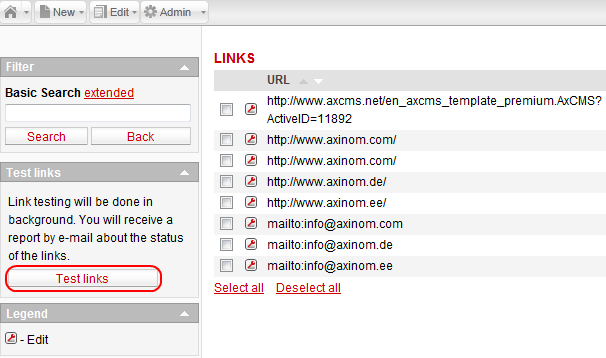 All links existing on all pages in your instance of AxCMS.net are displayed in the list. The links can be edited for a single object or for all the objects the link is used with. External and internal links can be tested for integrity by using the Test links function. "Dead" links become displayed and can be edited or deleted. Please note that after changing or deleting the link, pages that contained the link need to be published again. Also, if a link is checked out on some page, it can’t be deleted on the LinksOverview page. The Test links section is located on the left side of the LinksOverview page. The section contains only one button, Test links. By clicking the Test links button you start the link testing process. This can take some time, depending on your Internet connection and on the number of links in your AxCMS.net instance. After the link testing task is completed, a summary email is sent to the email address specified for this in the web.config file.